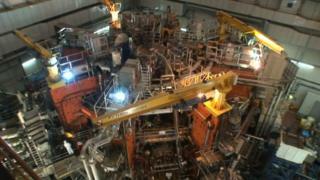 A nuclear fusion project in Oxfordshire has received 100m Euros (£92.1m) of EU funding, securing its future. The Joint European Torus (Jet) in Culham is home to the world's largest fusion reactor and has more than 500 staff. The Department for Business said the funding guarantees its future until the end of 2020, regardless of Brexit. Scientists from across the EU use the reactor for experiments on potential carbon-free fusion energy. In 2017 the government confirmed Jet would continue to receive UK funding, but the EU covers 88% of the running costs. The contract was due to end in December 2018, but the centre now has enough funding for at least two years. Science Minister Chris Skidmore said: "Science has no borders and as we leave the EU, this kind of international collaboration remains at the heart of our modern Industrial Strategy to maintain the UK's position as a world leader in research and innovation." The government says the contract extension "leaves open the option of a further extension to Jet's operations until 2024". Professor Ian Chapman, of the UK Atomic Energy Authority, said: "Jet has been a shining example of scientific co-operation between EU members, and this news means that these mutually beneficial collaborations will continue, allowing us to do essential experiments on the path to delivering fusion power."